Teach Words for Time, Time for Words to present and practice key words and vocabulary related to time – minutes, hours, months, days of the week. 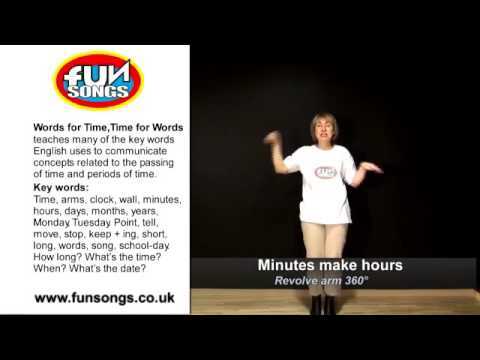 The Words for Time, Time for Words action song package contains an invaluable set of graded worksheets to practice and recycle the themes and language contained in the song. Children love performing Words for Time, Time for Words to friends and family at school events. A complete teaching actions video for Words for Time, Time for Words . Learn the song and its actions before teaching it to your classes. Three MP3 files of Words for Time, Time for Words: two guide-voice versions (original Charles Goodger voice and child-voice) and the music-only, karaoke version to check learning and play for performances and events. Set of five graded PDF worksheets to rework the content of the song. You can photocopy or project them on a LIM. Words for Time, Time for Words is useful for teaching key time-related vocabulary: minutes, hours, days, weeks and the days of the week – Monday, Tuesday, Wednesday, Thursday, Friday, Saturday, Sunday. It will focus your young learners’ minds on the inexorable nature of time.